Vertipedia - Robert D. (Bob) Powell, Jr.
Robert D. (Bob) Powell, Jr.
Robert D. (Bob) Powell, Jr. joined AHS — The Vertical Flight Society in 1952, when the Society had only been in existence for 9 years, and became its second longest serving member after 66 years. Powell was a graduate of the University of Virginia and a US Naval aviator. He flew the Grumman F8F Bearcat on active duty, and the Vought F4U Corsair and Grumman F7F Tigercat in the Naval Air Reserves at Norfolk, Virginia. He also earned wings of the National Advisory Committee for Aeronautics (NACA) during his service at Langley Field; there, he was primarily involved in testing helicopter rotors on the Langley hover stand. Shortly after NACA became the National Air and Space Administration (NASA) in 1958, Powell, with several other helicopter engineers, transferred to the US Army Transportation Research Command (TRECOM), a forerunner of the Research, Development and Engineering Command (RDECOM) component still located at Fort Eustis, Virginia. Powell continued to work there as a project engineer for helicopter research programs, including the Heavy Lift Helicopter, Integrated Technology Rotor and AH-1 rotor blade replacement programs, to mention just a few. After he retired from US Army civil service, he was employed for several years by Kaman Aerospace Corporation as its regional representative. Powell holds the record in recruiting Society members, with more than 400 new members sponsored. He won the Society’s Individual Member Sponsor Contest Awarded in 2002, 2004 and 2011, which is given to the member who sponsors the greatest number of new members during the contest year. 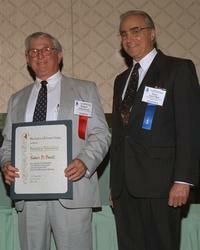 Powell served for many years as the Treasurer of the Society’s Hampton Roads Chapter and as the administrator for the annual chapter-sponsored international technical meetings. He was primarily responsible for managing the chapter’s financial resources in a way that allowed the chapter to award college scholarships, support local science fairs and contribute to museums that have a substantial interest in educating the public about the history of rotorcraft and their role in civil and military applications; his financial stewardship also allowed the chapter to support the Society headquarters’ mission of advancing vertical flight. For his service to the Society, he was named an Honorary Fellow in 1996, as shown in the photo with Gary Rast, then the AHS president and Sikorsky’s vice president for government business. Powell passed away Aug. 6, 2018 at the age of 95. To honor his financial stewardship during his tenure, The Vertical Flight Society's Hampton Roads Chapter has long established a Robert Powell Scholarship for high-achieving university entrants pursuing a STEM major related to aerospace and aviation. Please visit the chapter website to make a donation in honor and in memory of Mr. Powell.